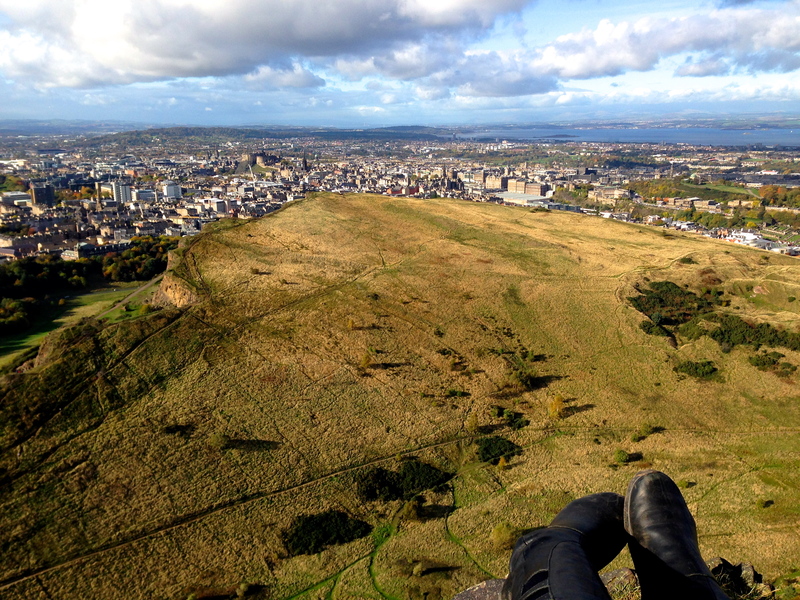 In the past three days, Lis and I have flown around 250 miles, walked around 25 miles, and managed to hike all of the major high points in Edinburgh. 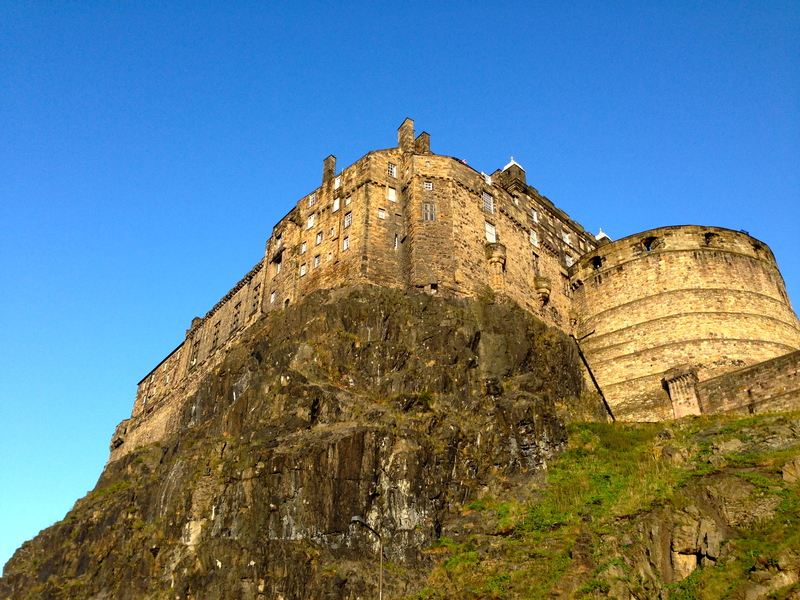 Edinburgh Castle is just one of those.Before we start, let’s get one thing clear. I love Ireland. Really, I do. I know, shocker — not like that was at all obvious from my ramblings on food and people and this island’s beauty. Still, I’m about to become the written equivalent of “all choked up” while discussing Edinburgh, so prepare yourself: this city is amazing. The first thing we did upon arriving was find food and caffeine (in the form of the best mochas we’d ever had) at a tiny cafe. Lis got a full Scottish breakfast — yes, that means there was haggis and black pudding — and once we’d finished eating, we headed out and decided our first stop would be to work out how to get up to the castle. 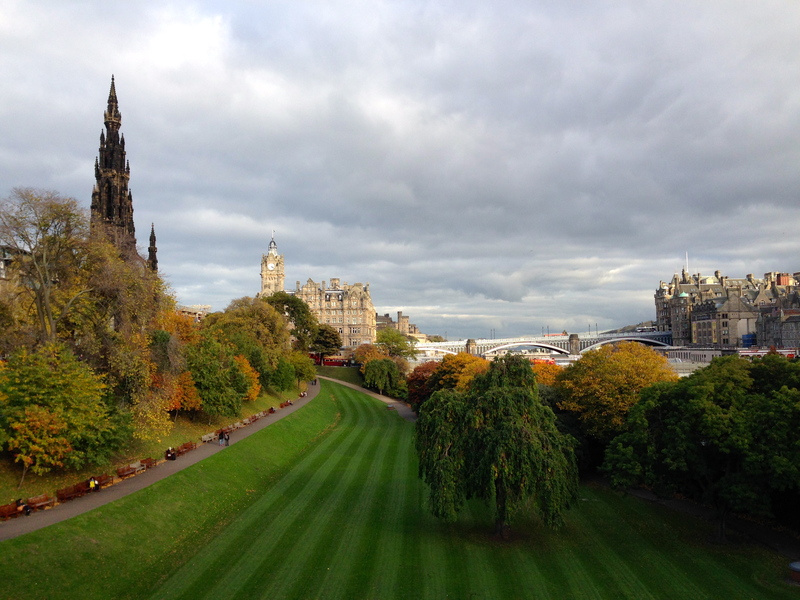 We were ready for a castle — you can see it from just about anywhere — but the view from the castle? Wow. After we stopped jumping up and down (yes, literally. We may be of one-and-twenty years, but we certainly weren’t going to let propriety keep us from properly celebrating our arrival in Scotland. Goodness! The very idea!) and staring all gobsmacked at Edinburgh, we continued our tour of the city by walking down the Royal Mile towards the Holyrood Palace. We didn’t get very far before stopping again. 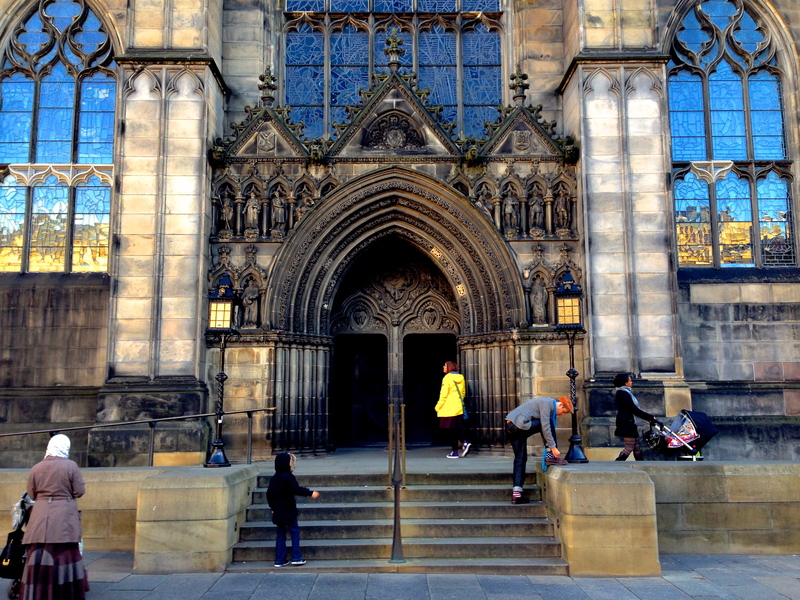 Did you really think I could walk past St. Giles Cathedral? I mean, look at it. There are rumors that the oldest parts of the church, four pillars, have been there since the 1100s. 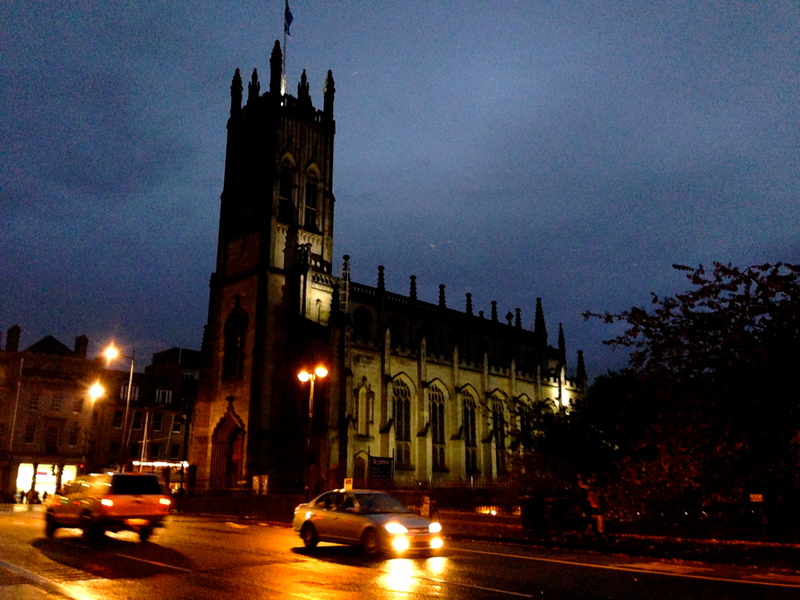 The High Kirk of Edinburgh is just absolutely beautiful. Okay. Brace yourself. 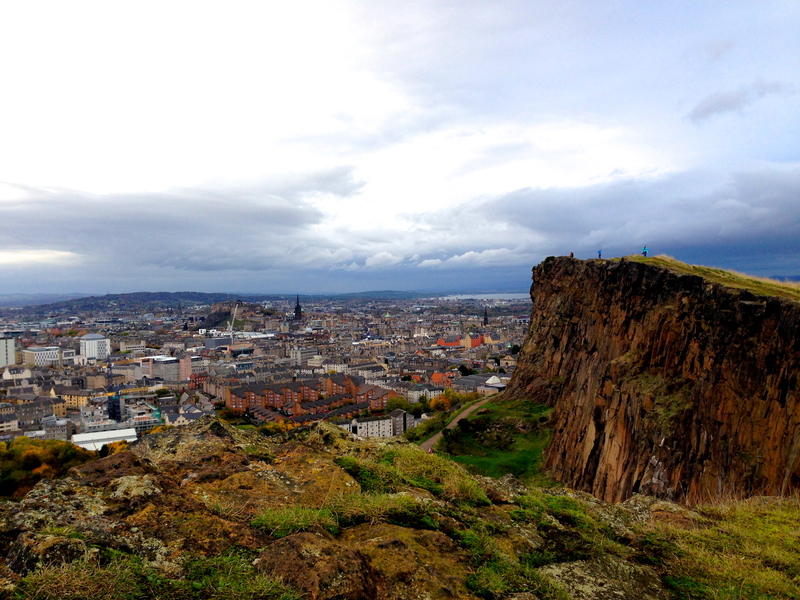 The hike was difficult (rather steep), but it brings you all the way up and above the city of Edinburgh… and gives you 360° view of the place. You could say it was spectacular. 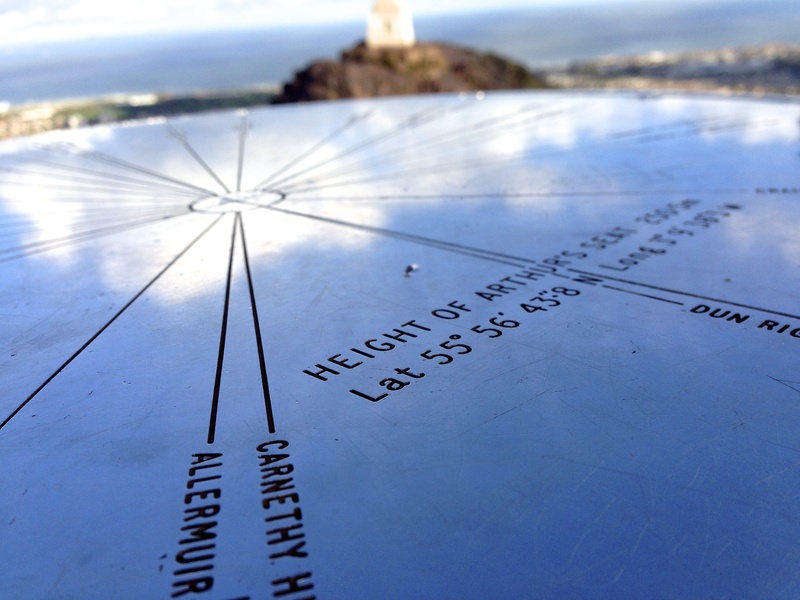 When we finally got too hungry to stay on Arthur’s Seat much longer, we headed back into town for some lunch. I met up with a family friend, Morven, for tea while Lis walked around some more. 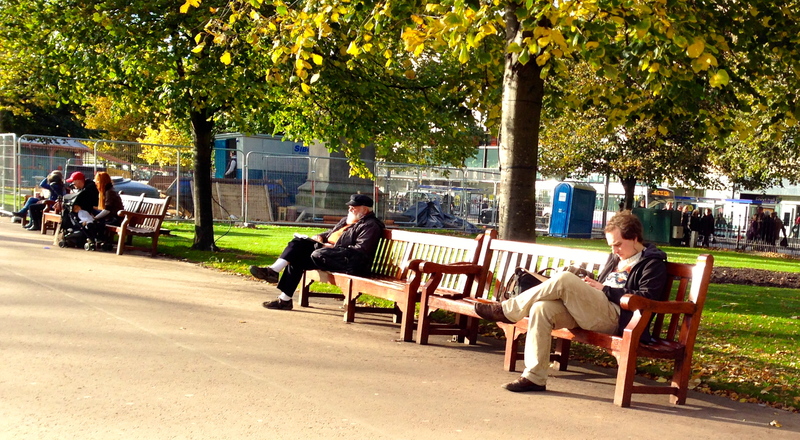 We met up over by Princes Street and decided to walk through the gardens. You can see why. This turned out to be a marvelous decision for three reasons: books, heights, and ice cream. books: We ran into George R. R. Martin. creeper photo because, you know. George Martin. Okay, we aren’t 100% sure it was him. Neither Lis nor I read A Song of Fire and Ice or watch Game of Thrones, so we didn’t actually go up to him and ask or anything. Still, I promise you that he looked exactly like George R. R. Martin. Seriously — down to the hat, beard, glasses, and facial expressions. If he wasn’t George Martin, he was certainly the most impressive look-alike I’ve ever seen. 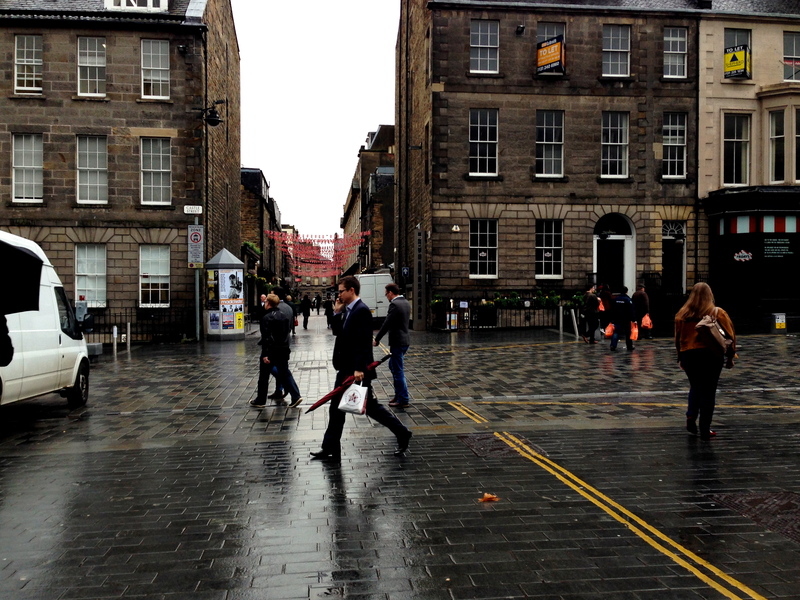 Still, if it was him, we aren’t entirely sure what he was doing in Edinburgh. 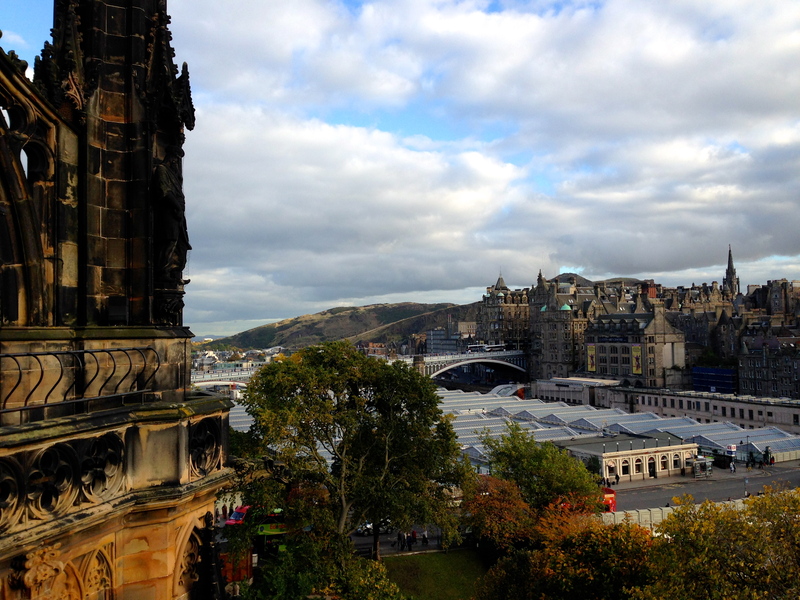 heights: From George Martin, we moved on to the Scott Memorial… which we discovered we could climb for £4. 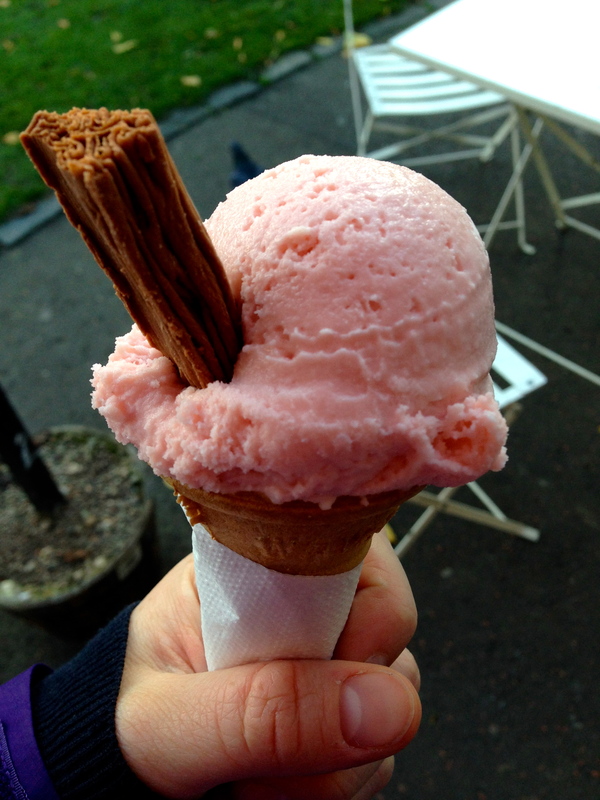 … best £4 we spent all weekend. The only difficulty here was that we arrived a mere twenty minutes before the memorial closed. Do you know how many stairs are in Scott Memorial? I wish we’d counted. Anyway — it was a lot of stairs, but totally worth the money, time, and energy. ice cream: well, I was hungry. The rest of the day was spent wandering the Princes Street Gardens, as well as going back around by the Castle and Grassmarket. We finally hiked down to Tollcross, a neighborhood where some of my family’s friends live, and settled in for the night. After becoming BFFs with the lovely children of the household (three boys, aged 8, 6, and 2) due to our extensive knowledge and understanding of both Star Wars and Doctor Who, Lis and I were able to relax and put our poor, sore feet up for a while. Plus, Michelle served us the most amazing butternut squash soup. Yum. 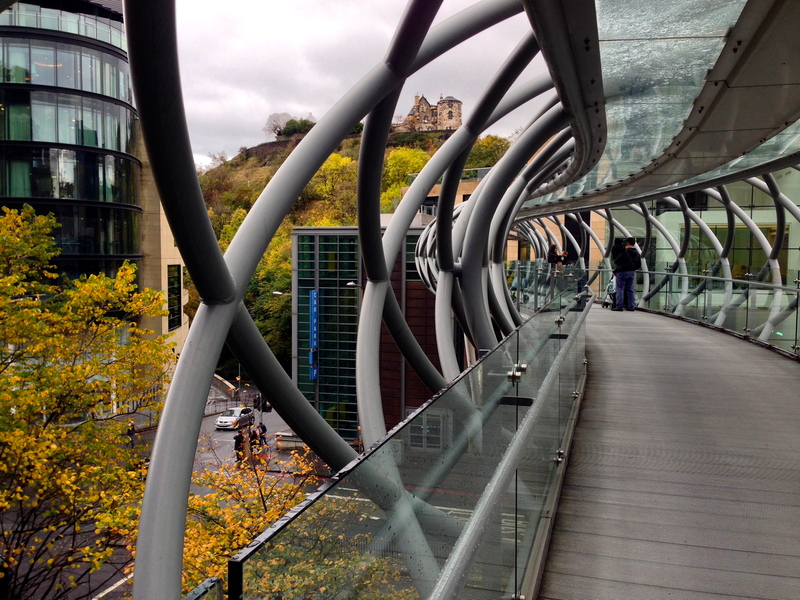 The next day dawned a bit grey and rainy: we headed for the National Museum of Scotland. This, I must admit, was the most well-organized, well laid-out, and well-lit museum I’ve ever seen. 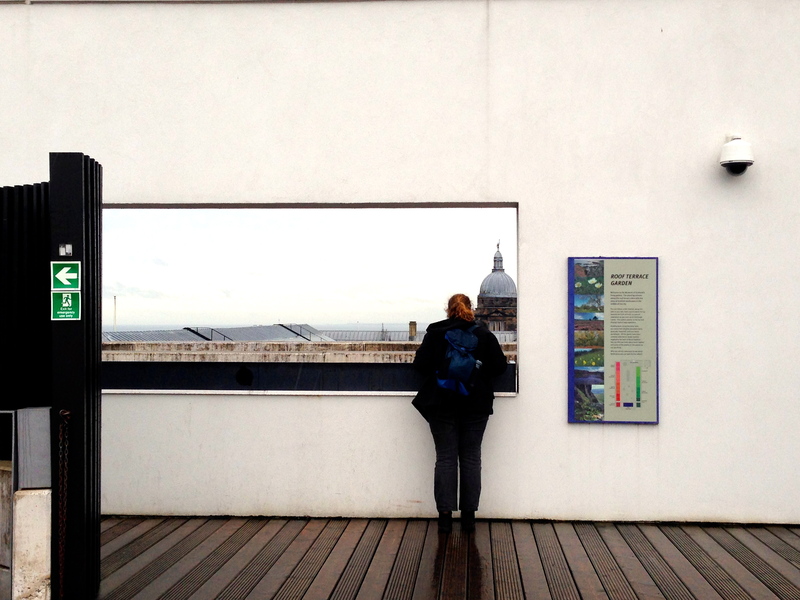 plus, it has a roof terrace. awesome. After a good couple of hours wandering all seven floors of the place, we headed off for lunch: pulled pork sandwiches from Oink, a restaurant that has a roasted pig in the window (I saw at least one or two other shops like this, by the way) and closes once the meat’s all gone. That is to say, they sell a pig’s worth of sandwiches per day. Delicious. Still, seeing as we hadn’t eaten much breakfast and were still hungry, we wandered around in hopes of finding more food. We stumbled across a street with banners and flags everywher and decided to investigate. After the initial disappointment brought about by a store called ROCK CANDY (which turned out to be a jewelry store and not at all a place to buy rock candy), we stumbled across a food market by the Gardens we’d walked the previous day. The moral of this story is always follow the decorative flags. Why? Well, that’s easy. 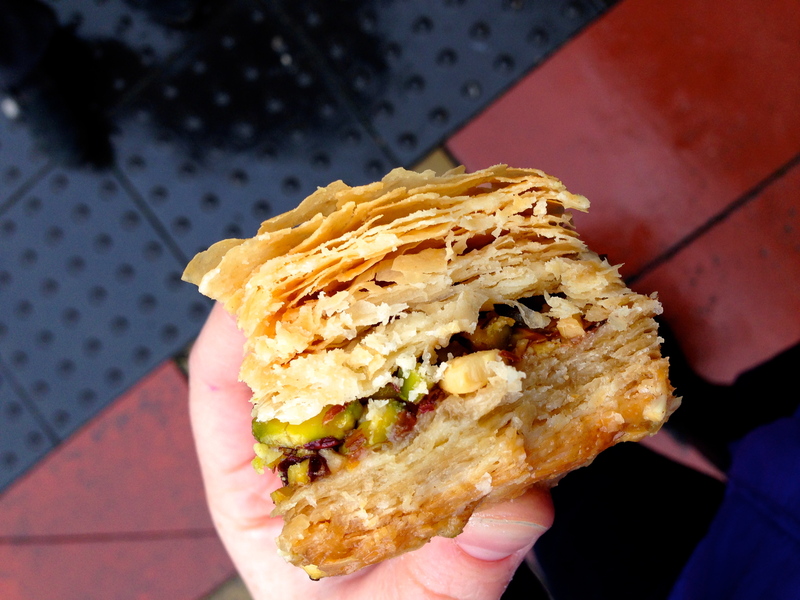 They seem to lead to food markets where you can buy anything from homemade fudge to German barbecue to wild boar burgers (you bet we tried one of those) to the most delicious baklava I’ve had in ages. The day got a little sunnier at this point, so we decided to hike up to Calton Hill and see what we could see of the city from one of its other high points. To get there, we traveled through a shopping center, a very odd bridge, and a parking deck. Still, the views were totally worth the rather unorthodox journey. After this we took the long way around to the Royal Botanical Gardens, which — apparently this is becoming a theme — were closing thirty minutes after we arrived. Because of this, we walked fairly quickly through the southern half of the gardens in order to get to the top of the hill, also known as “City View Point.” The plants we did see were beautiful: while Ireland is all green and gold, Scotland seems to have more trees that go the orange/red route during autumn. 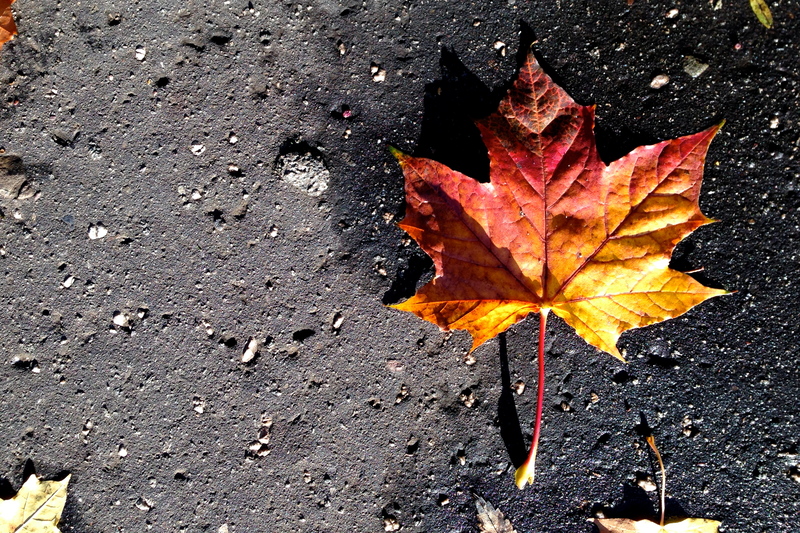 The slightly cooler temperatures might also have to do with the plethora of colors: Dublin isn’t quite chilly enough for a proper autumn yet. Still, I’m putting it down to tree types. From here, we made a quick stop by a store called The Marshmallow Lady. Did you know that you can make flavored marshmallows? Not those weirdly pepto-bismol-type ones that Kraft makes, though — I mean proper, homemade, all-natural spices and flavors added marshmallows. I vaguely knew that marshmallows weren’t only factory-produced blobs of sugar, but these blew my mind. I ended up buying the pumpkin spice ones (saving the last three for some hot chocolate! 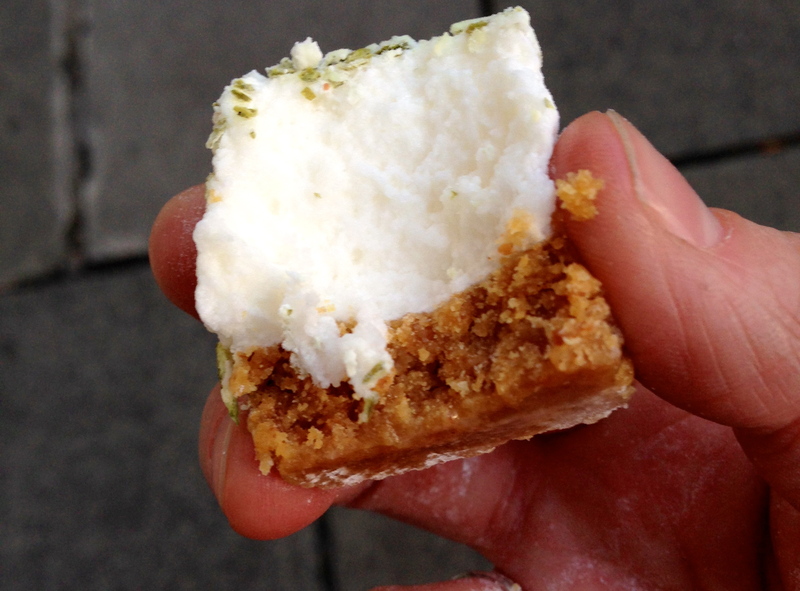 ), and Lis bought the Key Lime Pie Marshmallows. I didn’t know it until then, but key lime pie was meant to be consumed in marshmallow form. From there it was back to our friends’ house, then out for drinks at the local bar. Now, I’m not usually a “beer person” — I’m just not — but, you know, being in Scotland, we decided to try the local ales (by the half-pint, since we are cheap and wanted to try more than one). I had the Pentland IPA, which was actually quite good! Lis tried the Bad Day at the Office and the Holy Grale, both of which were also delicious. All of this was at a local bar in Tolcross called the Cloisters, which was a bit small compared to the size of most pubs I’ve been to but still quite lovely. At this point we decided it would be a very fun thing to see the city all lit up at night, so we dragged our poor, aching legs and feet back towards the castle. Tired as we were, we were right: the views of both the castle and the city were quite lovely! From there it was back to Tolcross and into a marvelous little place called The Blackbird, where I tried a Gladstone (which involved ginger ale, rhubarb, and lemon) and Lis tried something I can’t reacall the name of that involved raspberries and limes. Yes. Fruit drinks. Typical. We know. They were both quite good, though, and we were quite happy with our decisions. The next day involved scones, drinks with a friend of mine from high school, and… another hike. Because why would we give our poor legs a day off when we have Sunday for that? 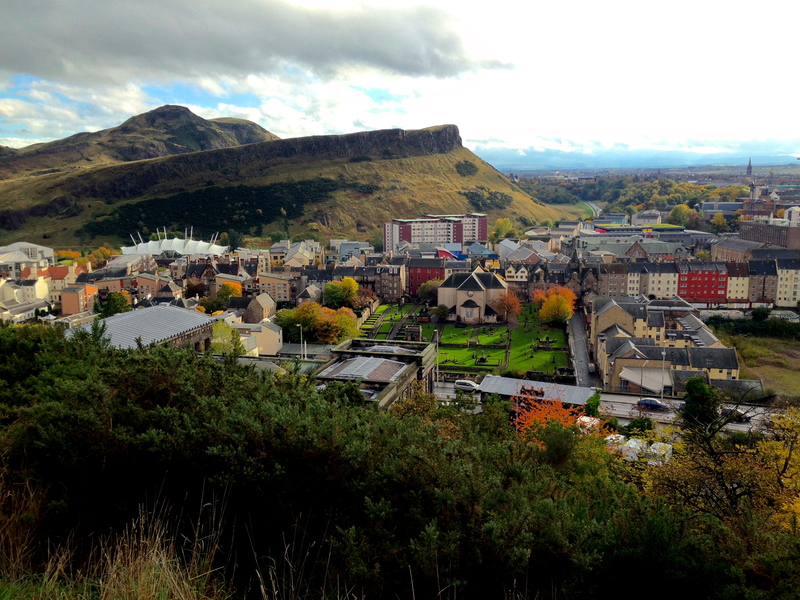 We didn’t feel quite up to hiking Arthur’s Seat a second time, but we did want to see what the view was like from the ridge right next to it, known as the Salisbury Crags. We walked around the cliffside for a while, enjoying the blustery weather and the golden sunshine. Yes, it was golden. Really. Maybe not in that picture, but shortly thereafter. I really don’t know why people call Ireland and the U.K. the lands of grey, rainy days. I’ve seen some rain, certainly, and plenty of cloudy days — we’ve had incredible weather for most of our trips around these islands. 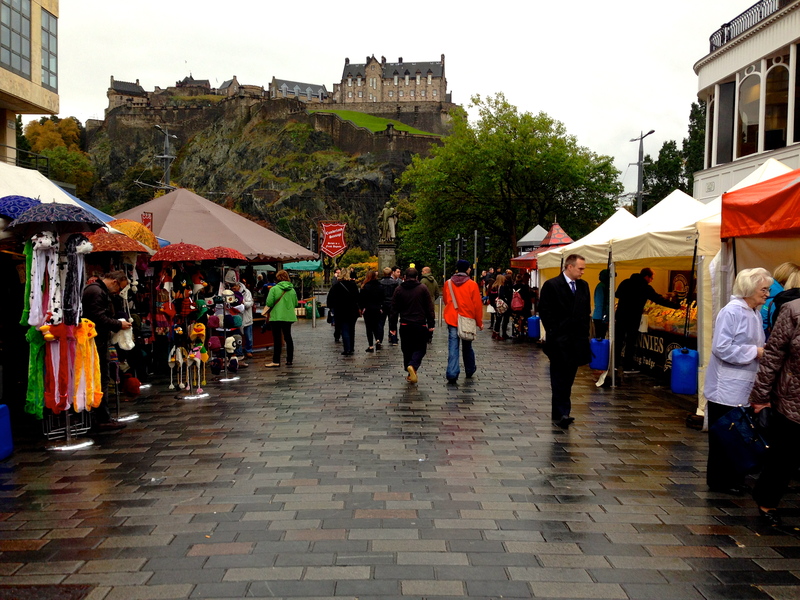 Alas, all good things must come to an end — including my three day trip to Edinburgh. After one last meal with our friends, Lis and I headed off to the airport and back to Ireland. Confession: I’ve never actually watched LOST. I know, shame on me. Still, I can’t help but quote it after trips like this — we have to go back! In other news, Lis and I have yet to determine both why and when Cups and Bohemian Rhapsody became the theme songs for our study abroad experiences. We’re currently blaming it on our current approach to our time here: #YOSAO (You Only Study Abroad Once. Say it YO-SOW, with the last syllable sounding like “ow” and not the “oh” of sowing seeds). pretty much sum up our traveling experiences. 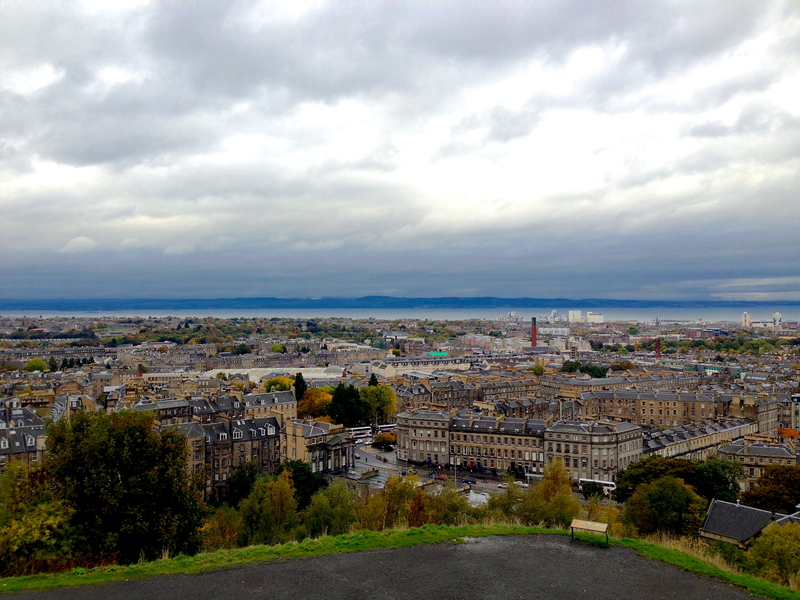 This entry was posted in a semester abroad and tagged amusing adventures, edinburgh, hiking, scotland, traveling, yosao by connor grace. Bookmark the permalink.